What do you mean, the angels don’t always rescue people? An angel got Peter and John out of jail didn’t he? I’m still waiting for an angel to get me out of dog jail though. So sometimes the angel doesn’t come? Now Stephen, a man full of God’s grace and power, did great wonders and miraculous signs among the people. Maybe Stephen could get me out of dog jail. Opposition arose, however, from members of the Synagogue of the Freedmen (as it was called) – Jews of Cyrene and Alexandria as well as provinces of Cilicia and Asia. 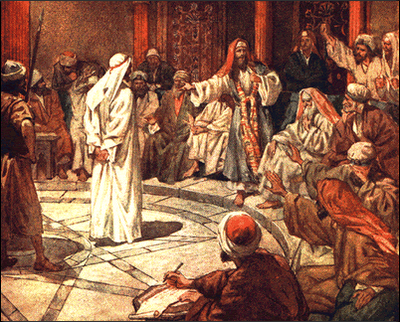 These men began to argue with Stephen, but they could not stand up against his wisdom or the Spirit by whom he spoke. Those men ought to listen to Stephen. Those men are up to no good. What do you mean, kind of like me? Those people are afraid of Jesus, aren’t they? If they were friends with Jesus he would give them fish. All who were sitting in the Sanhedrin looked intensely at Stephen, and they saw that his face was like the face of an angel. If Stephen has a face like an angel those angels will come rescue him for sure. What do you mean, I have to wait until the next story to find out what happens to him? I think I’m going to hang out in my dog jail. There’s got to be an angel coming soon to rescue me from there.